Removal Boxes Spain - How Many Boxes Are You Going To Need? Removal boxes Spain come in many different shapes and sizes, and sometimes it can be difficult to work out exactly what it is you need when it comes to purchasing your packing materials. The answer really depends on what you need to pack, and how heavy the items actually are. Estimating the number of boxes required for your Spain removals is a useful thing to be able to do, since it will cost you money to order packaging materials, and any that you don�t use will simply be wasted. For removals to Spain, and any other move, the very best way to work out how many boxes are required is to ask your professional removals company. The experts will be able to give you a guide as to how many boxes � and other packing materials such as tape and bubble wrap � you will need as they walk around your property. They should also be able to provide the boxes, tape, wrap and so on for you, so that all you need to do is actually pack them. In some cases, should you wish, your professional removals company can package your belongings in boxes too, in readiness for your move to Spain. However, if you prefer to pack your home yourself, and you want to find your own boxes, then as a rough guide, a small property (up to 750 square feet) should need approximately two large boxes, 15 medium boxes, and five small boxes. For between 750 and 1,250 square feet it will be approximately four large, 20 medium, and six small. 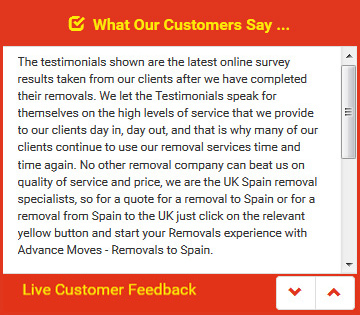 Full international removals packages, including removal boxes Spain, can be found at Advance Moves (http://www.advancemoves.com/). Our customer service and knowledge in moving our clients to and from Spain mean we can always help. Contact us on 0871 218 0612 or email info@advancemoves.com for prices, information, and advice.